Walter John Purchase was born in Yeovil in 1880, the elder son of labourer Walter Purchase (1851-1889) and Ruth née Smitheram (1839-1901). Ruth had previously been married to Eli Stuckey (1839-1862) and had four children by him. She was to have a further three children with Walter Purchase: Robert (b1869), Mary Elizabeth (b1876) and Walter Jnr. After the death of Walter Snr she would marry William Hawkins in the spring of 1901, just before her death. In the 1881 Walter and Ruth, together with their three children and another family of five people were listed living at 29 Higher Kingston. In 1889 Walter Snr died and, in her reduced circumstances, Ruth was forced to move with her children to New Prospect Place - a long terrace of small cottages at Goar Knap, little better than slums and occupied by the very poorest families. In the 1891 census Ruth was listed as a laundress and living with her and the children (and listed as a 'visitor') was her future husband, labourer and widower William Hawkins. By the time of the 1901 census the family had moved to 2 Edwards Buildings, also known as Edwards Court - a short terrace of some six or seven dwellings off the south side of Higher Kingston. By this time Ruth and William Hawkins were married and were living with Walter, by now aged 21 and listed as William's stepson, and William's grandson Henry Dyke. Both William and Walter gave their occupations as general labourers. In the summer of 1902 Walter married Sarah Ann Guppy, ten years his senior, at Yeovil. They were to have six children although three died in infancy. Sarah was from West Coker where she and Walter lived before their marriage and two of their surviving children were born; Jane (b1899) and Walter John Jnr (b1903). Their daughter Dorothy was born in Yeovil in 1910. In the 1911 census the family was listed at 30 South Street. Walter worked as a gas fitter for Yeovil Corporation while Sarah worked as a leather glove liner in a glove factory. Walter enlisted at Yeovil, joining the 1st Battalion, Grenadier Guards. He became a Guardsman with the Service Number 22133, indicating that he enlisted in January 1915 (a little later than the Western Gazette would later have it). He went to France with his battalion in November 1916. He initially saw no major actions but during the summer of 1917 the 1st Battalion, Grenadier Guards were involved in the German retreat to the Hindenburg Line. Walter's first major engagement would have been the Battle of Pilckem Ridge, 31 July – 2 August 1917. This was the opening attack of the Third Battle of Ypres. The British Fifth Army, Second Army and the French First Army on the northern flank, attacked the German 4th Army which defended the Western Front from Lille, to the Ypres Salient in Belgium and on to the North Sea coast. On 31 July, the Anglo-French armies, including 1st Battalion, Grenadier Guards, captured Pilckem Ridge. After several weeks of changeable weather, heavy rain fell during the afternoon of 31 July. We know that Walter had been wounded before his final action and his wound may have been received at this time. The battalion was next involved in the Battle of the Menin Road. This was the third British general attack of the Third Battle of Ypres. The battle took place from 20–25 September 1917, in the Ypres Salient in Belgium on the Western Front. During the pause in British and French general attacks between late August and 20 September, the British changed some infantry tactics, adopting the leap-frog method of advance, where waves of infantry stopped once they reached their objective and consolidated the ground, while other waves passed through the objective to attack the next one and the earlier waves became the tactical reserve. General adoption of the method was made possible when more artillery was brought into the salient, by increasing the number of aircraft involved in close air support and by specialising the tasks of air defence, contact-patrol, counter-attack patrol, artillery observation and ground-attack. Walter was next involved in the Battle of Poelcappelle (9 October 1917) that marked the end of the string of highly successful British attacks in late September and early October 1917, during the Third Battle of Ypres. Only the supporting attack in the north achieved a substantial advance. On the main front the German defences withstood the limited amount of artillery fire managed by the British after the attack of 4 October. The ground along the main ridges had been severely damaged by shelling and rapidly deteriorated in the rains, which began again on 3 October, which in some areas turned the ground into a swamp. Dreadful ground conditions had more effect on the British, who needed to move large amounts of artillery and ammunition to support the next attack. The battle was costly to both sides. The First Battle of Passchendaele took place on 12 October 1917 in the Ypres Salient of the Western Front, west of Passchendaele village, during the Third Battle of Ypres. The Allied plan was to capture Passchendaele village. This was based on the incorrect assumption that during the Battle of Poelcappelle, three days previous, the attacking troops had captured the first objective line. In fact, the Allied front line near Passchendaele had hardly changed and the true position of the Allied front line, meant that the planned advance of 1,500 yards (1,400 m) was actually 2,000–2,500 yards (1,800–2,300 m). The assault was directly south of the inter-army boundary between the British Fifth and Second Armies and consequently pitted a collection of formations from both armies against the German Fourth Army. Despite advances on the northern front of the battlefield, the German's retained control of the high ground on Passchendaele Ridge and consequently the attack failed in attaining its principal objective. Although the battle was costly to both sides, the battle was considered a German defensive success. Walter John Purchase was killed in action during the battle. He was 37 years old. In its edition of 2 November 1917 the Western Gazette reported "Official information has been by Mrs Purchase, of South Street, that her husband, Private WJ Purchase, of the Grenadier Guards has been killed in action. Private Purchase went to France in November of last year, and had been in the Army about three years, and had been wounded once before. He was 37 years of age." 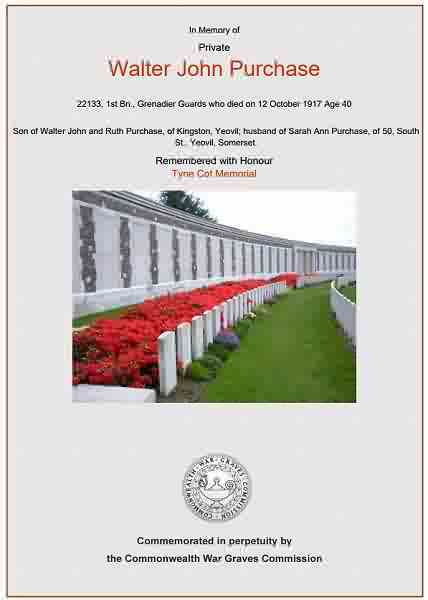 Walter is remembered on Panel 9 of Tyne Cot Memorial and his name is inscribed on the War Memorial in the Borough.